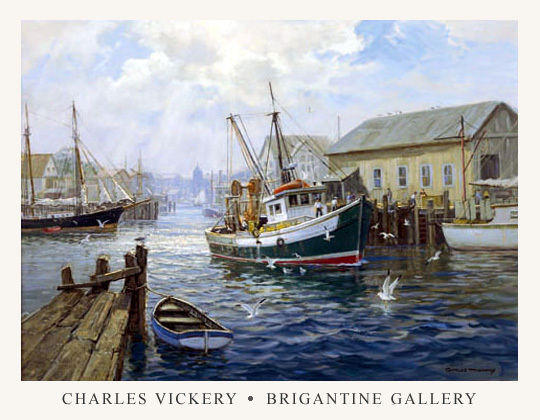 We are excited to offer you the museum quality fine art posters of internationally acclaimed maritime artist Charles Vickery (1913 -1998). This is the first publishing of Mr. Vickery's work in over 10 years. 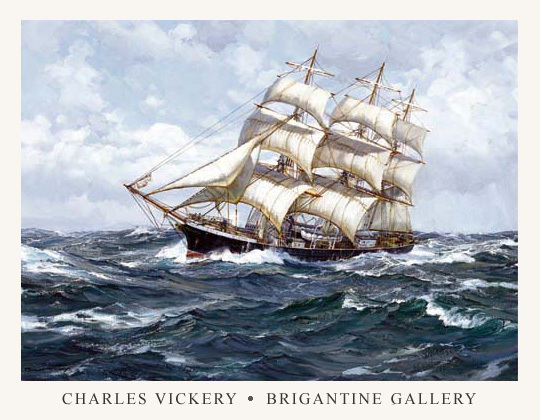 In Mr Vickery's career, over 100 limited edition prints have been published of his works, some reaching as high as $4,800 in the after market. The reason for now issuing these beautiful open edition posters is to make his artwork more affordable to the masses. These posters are made directly from originals that are in private collections and have never been published before in any form. 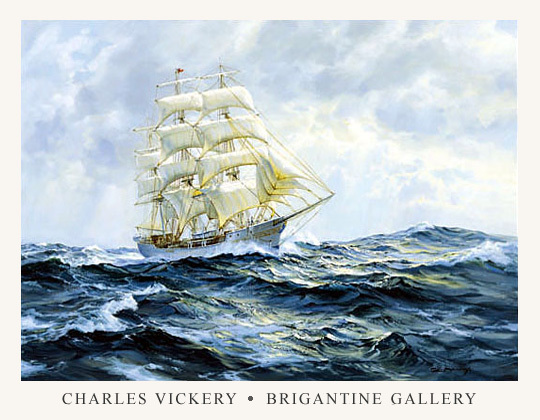 This is from an original 24 X 36 oil on canvas depicting the New England whaling ship "Joseph Conrad" as she plies through the seas in fair weather. This whaler still exists and can be seen and toured at Mystic Seaport in Mystic Connecticut. A classic New England scene of Gloucester harbor, which is on the Massachusetts coast north of Boston. 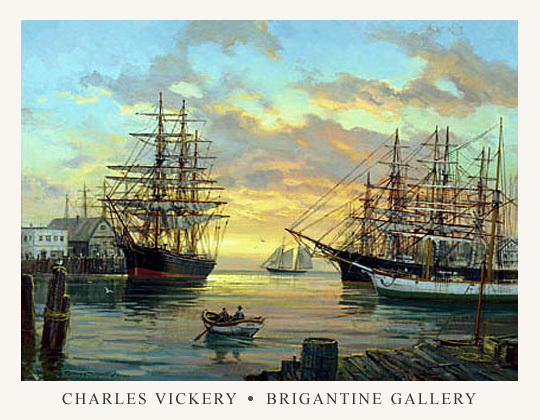 Mr. Vickery spent many summers sketching and painting this historic whaling town. This is from the original 30 X 40 oil. 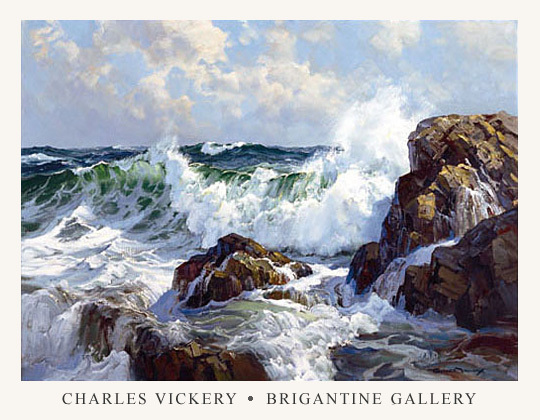 Mr. Vickery was often inspired by the New England coastline, especially Bass Rocks near Gloucester. This beauty shows in fine detail the mastery and command he had depicting where sky, sea and land met. A rare and unique depiction of the waning days of the great sailing era. 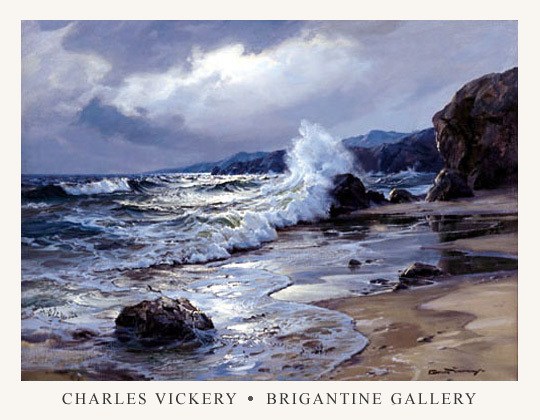 This original 24 X 30 oil was based on a poem that inspired Mr. Vickery to create this masterpiece. 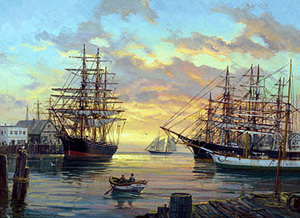 Incidently, the ships in this painting were a compilation of the wooden ship models he used in his studio. They are the Otego, Sea Witch, Galilee, and the Harriet MacGregor. Very few artists can catch the night time moods as shown in this beauty, where clouds and moon interact with the sea. From an original 24 X 36 oil. This is a depiction of the famous Norwegian training ship that still sails the oceans today. Many a young cadet are trained as to the traditional methods and skills needed to carry on the great Scandinavian maritime heritage.